And the mad cow mocks every passer… ~ Zane White. "Wild Turkeys in Mt. Taylor"
During the summer of 2015 I visited the Mt. Taylor area to begin my research on the legacy of uranium mining in the Southwest, which has caused irreparable harm to the people and the environment of that area, most often tribal people and tribal land. Mt. Taylor has spiritual and cultural value to all of the tribal communities in New Mexico. It is a place I remember going often as a kid with my dad to camp and hike. The surrounding area is full of open land areas containing landscapes of alpine mountains, grand cliff and mesa country, and a very large volcanic formation containing caves that are home to a large bat population. Because of this, I have frequented this area many times in life for outdoor activities and was already familiar with the area. What I had not taken notice of on the many visits previously, was a very sinister monster hiding in plain sight. 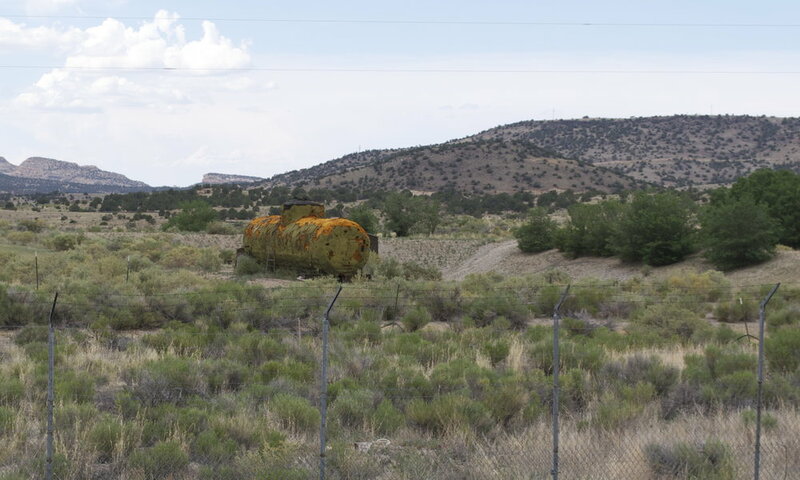 Though the story of uranium mining is fairly widely known in New Mexico, it is not a common topic of conversation, and, at least in my head at the time, the issue seemed to be a relic of the past, not a present day threat to the health and well being of every New Mexican. I took a tour of the area and visited three sites in particular. Ambrosia Lake, The Homestake mine, and the Mt. Taylor mine. All three are situated in the middle of nowhere in between Grants and Milan, New Mexico. The sites are tucked away from the highways and easy to pass by. In the case of the Homestake Mine and Ambrosia Lake, the superfund sites themselves are not much to look at. Eerie pipes sticking out of the top of man made flat hills of gravel and dirt designed to cover up the remnants of the mill tailings left from decades of uranium mining. The monster, in this case, is unseen and takes the form of invisible radioactivity poisoning the land, air, and water of many residents. The area is riddled with collapsed small mining communities that look like something out of Mad Max. 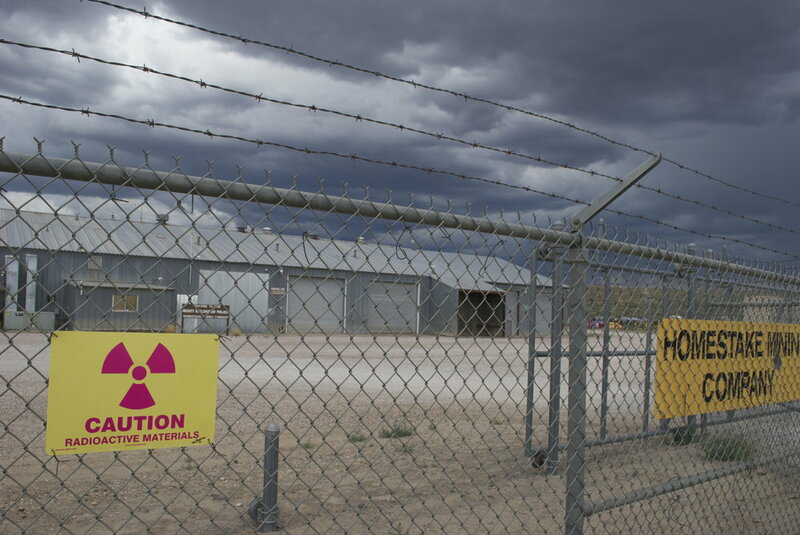 Broken down trailers, half of which have been abandoned, and large fenced off areas with marked warnings of radioactive danger. Desolate... Quiet... But buzzing with an energy of sickness, reminding me of the sound of a Geiger counter going off. Again, as with the Molycorp Mine in Questa, the demand for this material comes out of a perceived necessity for an infinite amount of ever more exciting weapons of mass destruction. I doubt that any of these mines would exist if not for the nuclear age brought upon the world by the military-industrial complex. Something that really is not a necessity, but a desire born out of intense paranoia. This map shows sampling sites for radon gas detection done by the EPA. The Mt. Taylor mine is more obviously a mine because it is not yet a superfund site. In fact, Rio Grande Resources, a subsidiary of General Atomic Corporation, has been trying to resume operations at the mine for 25 years. The site was run for most of its existence by none other than our snake oil friends at Chevron Corporation, who also profited from the Questa Mine. While on standby status the owners of the mine do not have to monitor contamination emanating from the site. 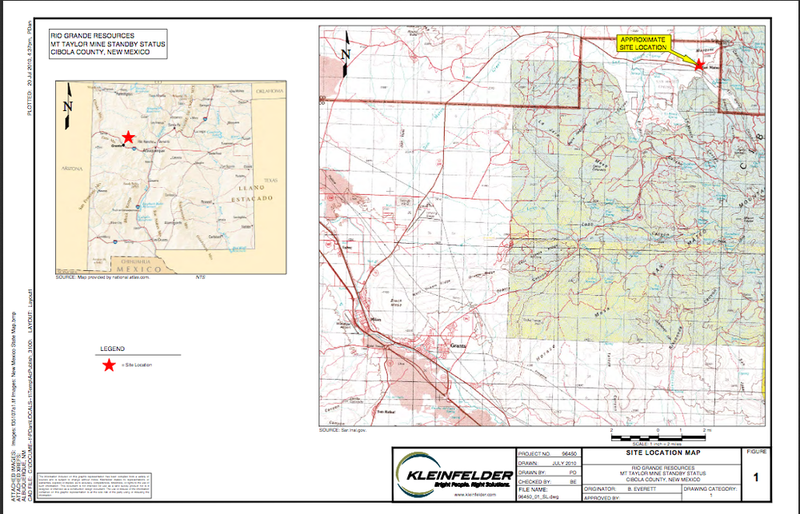 What prompted my renewed interest in this site, was news that company was seeking a permit to begin new operations in the area, and various organizations were working together to inform the public to stop the issuing of the permit. Fortunately, the company has not been granted the permit it has sought, however, it still remains on standby, which means that the amount of contamination at this site is still unknown. The Mt. Taylor mine is situated on NM 605 30 miles or so north of the Grants- Milan area. You can also reach it by driving up into Mt. Taylor(239) and taking 456. This is the route I took, so I could sandwich a night under the stars in a beautiful mountain range between the two day visit of contaminated land below. Immediately after descending the mountain on 456 the site can be seen. Old containers the size and shape of the large propane tanks used to heat homes, riddle the large area. The containers have a brilliantly composed decay of a luminous orange rust against the old faded army green paint that once covered the entire container. When I looked at these containers with a mix of curious amazement and shock, I swear I could hear the imaginary Geiger counter ticking again. To the north, an old rusted pipeline stretches out across the land for miles. At the center of the mine area, there are large structures used to bore underground. These also look old and rusted. The perfect site for a post-apocalyptic movie starring Tom Cruise, Nicholas Cage, and Sylvester Stallone. Using my zen navigation techniques I also ran into a majestic white horse on the way to look at Ambrosia lake. I have not begun painting work based on this site yet because of other projects I am completing, and the vastness of this site alone. 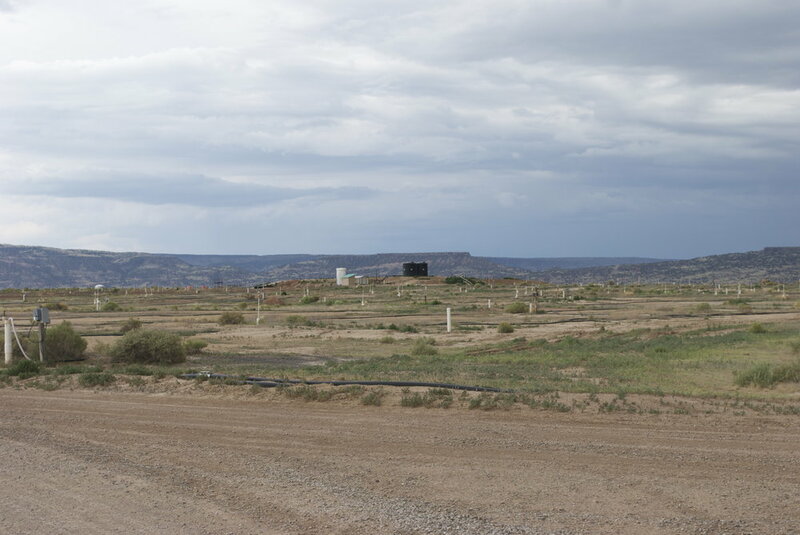 Even after years of awareness and social work put into dealing with the legacy of uranium mining in New Mexico, unfortunately, the population of this area still suffers from contamination of the groundwater, and air. It is likely that this area will remain contaminated for a very long time, despite the efforts at mitigating the impact to human health. Lawsuits have been brought. Mines shut down. The state and the companies have been forced to clean up the land. Documentaries. publications. studies. All with renewed efforts at bringing awareness to the issue. However, the lessons of the past still are not enough to do what is necessary to keep this from happening ever again. View Atop Mt. Taylor By Zane White. The View from the top of this truly sacred mountain is the best reason to oppose any further development of this land. A view seen by many before us. How many will see it after? Let's take a moment to put this in historical context. I feel that especially among people of my generation and younger, these issues are interpreted oftentimes as being a deviation from the norm, or a rare occurrence. And they seem to exist as individual entities separate from time and history. However, when we put together patterns, the solution to the issue becomes much more clear. 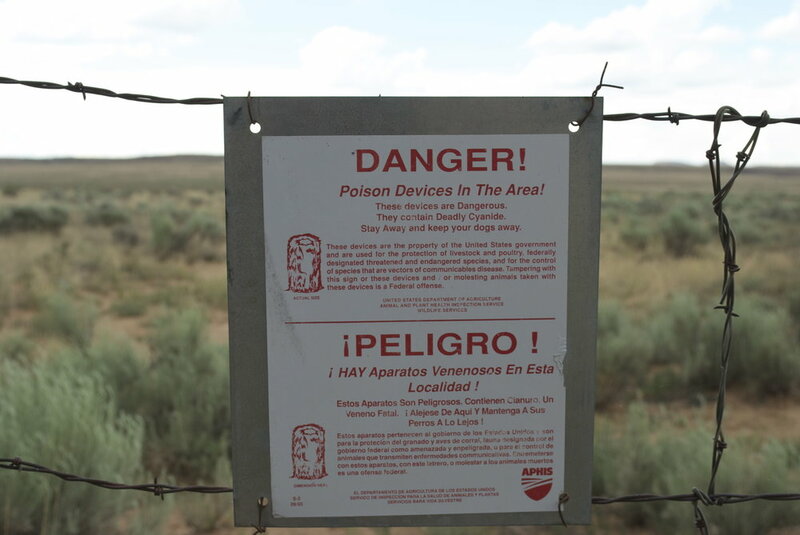 As a separate issue, the legacy of uranium mining in New Mexico is tragic. It seems unavoidable. A byproduct, or early mistake, of the nuclear power industry. Something that stands as an expected casualty of the marvel of nuclear energy. When put alongside, Chernobyl, Three Mile Island, Fukushima, The Hanford Storage site in Washington state, the WIPP in New Mexico, and an even longer list of the communities of the west damaged by the mining of the uranium ore itself, we begin to get a better diagnosis of the issue, and we haven't even gone into the topic of how this energy is used in warfare. The lesson from this local story is the same lesson we should have learned the day after (preferably the day before) the skies of Hiroshima were set afire with the promise of an atomic age. The lesson is to stop building more atomic facilities and atomic weapons. President Obama authorized a trillion dollars in modernizing our nuclear weapons stock by creating more precise and less powerful strategic nukes. This is ridiculous. The shocking and tragic reality is that the nuclear beast cannot be buried in the past. The poisonous remnants from its existence are here to stay for lifetimes upon lifetimes. The predicament of how to store the waste generated from the production of nuclear energy in a satisfactory and safe way alone is still unsolved by the worlds best minds. Anyone who begs to differ should take a trip to the underground tunnels of the Hanford site or the WIPP site to see for themselves. We have to deal with what we already made, but that does not mean we have to make more. Dismantle the nuclear beast! As they say! No More Nukes! Stop production! Support Disarmament, and Non-Proliferation. That is the one and only answer. On a tangent of research on this topic, I have also discovered that every major waterway in New Mexico is contaminated by some operations on its way to the homes of residents everywhere. I'm sure some places are cleaner than others, and water testing is done often, however the stark fact that every major river has contamination somewhere along the way was extremely disturbing to me, and even more disturbing is my guess that this is same for most of the United States, and probably the world. Homestake structure at base of largest mill tailing pile. Found on large fenced off area north of the main tailings mill. More questions than answers. Stretching northward toward the cibola national forest.